On the morning of 26 April 2016, the sister of jailed human rights defender Mr Guo Feixiong visited him in Yangchun Prison, Guangdong Province and expressed serious concerns for his health. Guo Feixiong, the 2015 winner of the Front Line Defenders Award for Human Rights Defenders at Risk, is currently serving a six year prison sentence for “gathering crowds to disturb social order” and “picking quarrels and provoking trouble”. Guo Feixiong, pen name of Yang Maodong, is a well-known figure in China’s rights defence movement and has been imprisoned a number of times for his human rights activities. On 27 November 2015, he was sentenced to six years in prison for his participation in peaceful protests in support of press freedom and for his involvement in a campaign urging the Chinese government to ratify the International Convention on Civil and Political Rights. In September 2015, Guo Feixiong was awarded the 2015 Front Line Defenders Award for Human Rights Defenders at Risk. At 10am on 26 April 2016, Yang Maoping, sister of Guo Feixiong, visited her brother in Yangchun Prison and reported that he looked paler and thinner than when she had last seen him on 29 February 2016. Guo Feixiong told her that on 7 April 2016, he was admitted to hospital and for over a year had been experiencing intermittent blood in his stools and bleeding in his mouth and throat. Furthermore, he told her on 19 April 2016, he experienced heavy bleeding and was unable to walk steadily, and on 25 April 2016, he was barely able to stand up. Whilst in hospital he was held in a 7.5 square metre windowless room for twenty-three hours a day with four others. Guo Feixiong had requested a full health examination but was reportedly informed that the prison warden would not permit it. When she saw Guo Feixiong on 29 February 2016, Yang Maoping requested that prison officials provide her brother with a full examination, including a lumbar MRI scan because he looked so unwell. Following her visit on 26 April 2016, she requested once again that Guo Feixiong be transferred to a higher level hospital for a series of tests, including a CT scan, endoscopy, colonoscopy and blood tests, diagnosis and treatment. The prison warden responded that Guo Feixiong had not made such a request to him, but that if the human rights defender lost consciousness, he would be sent immediately to hospital. Yang Maoping insisted that waiting until then may be too late and that if the prison warden did not have the authority to approve it, then he should ask his superiors to approve the transfer. In 2005, the human rights defender provided legal assistance and organisational support to residents in Taishi village in Guangdong province who were seeking to remove their village chief whom they accused of corruption. As a result of his involvement in this case, he was held by the police for three months without charge, during which time he went on hunger strike to protest his treatment. When he was released in December 2005 he was subjected to regular surveillance, harassment and at least one severe beating before being detained again in September 2006. In November 2007 he was sentenced to five years in prison, back dated to his arrest the previous year, for “illegal business activity” following his publication of a book documenting a political scandal in China’s north eastern Liaoning province. 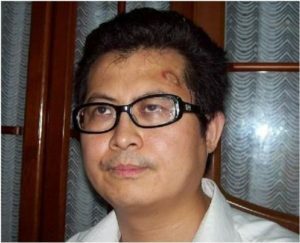 On his release in September 2011, Guo Feixiong said that the treatment he received while in police custody and later in prison was “beyond people’s imagination”. He was reportedly shackled to a wooden bed for forty-two days and hung naked from a ceiling by his arms while police used an electric baton to electrocute him. I am deeply concerned about the health of human rights defender Guo Feixiong and the lack of medical care which he has received. 3. Guarantee in all circumstances that all human rights defenders in China are able to carry out their legitimate human rights activities without fear of reprisals and free of all restrictions.